How do you air fry tofu? 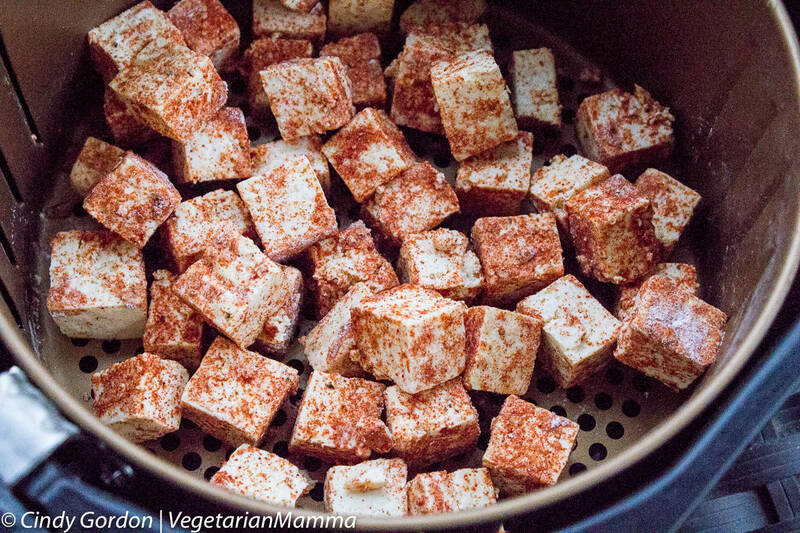 Tofu can be tricky to cook, but don’t let that stop you! 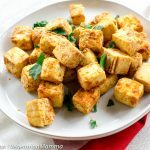 Air Fryer Tofu is a delicious recipe and super simple method for getting a crunchy outside and a soft inside for all your airfryer tofu bites. If you’ve been following me and reading some of my other air fryer recipes, then you know that I truly love using the Air Fryer. If there was ever a doubt of skepticism from me about if I would love the appliance or not, it’s 100% gone now. 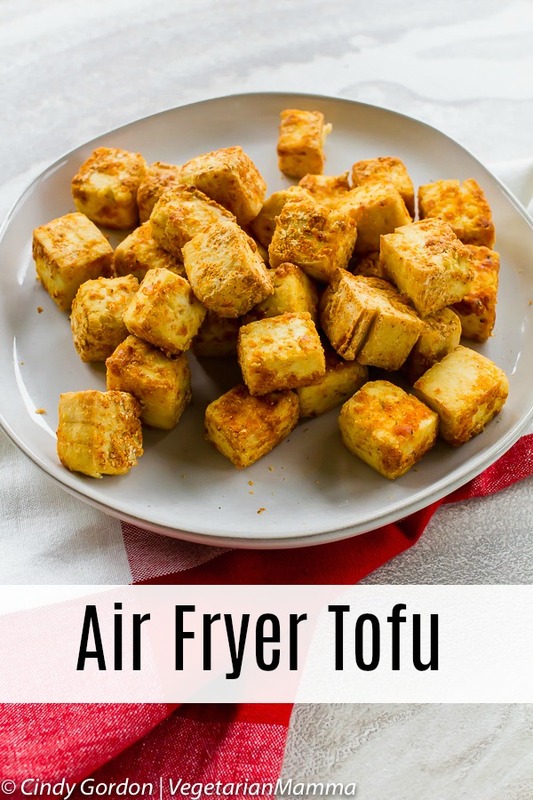 The Air Fryer is a GREAT way to cook many things and tofu is one of them! In our house, we eat tofu quite often. Being vegetarian, it’s a great way to supplement in something a bit different and healthy for us and our taste buds. We’ve cooked it so many different ways that it’s hard to even truly remember them all now. The one thing that I know for certain? 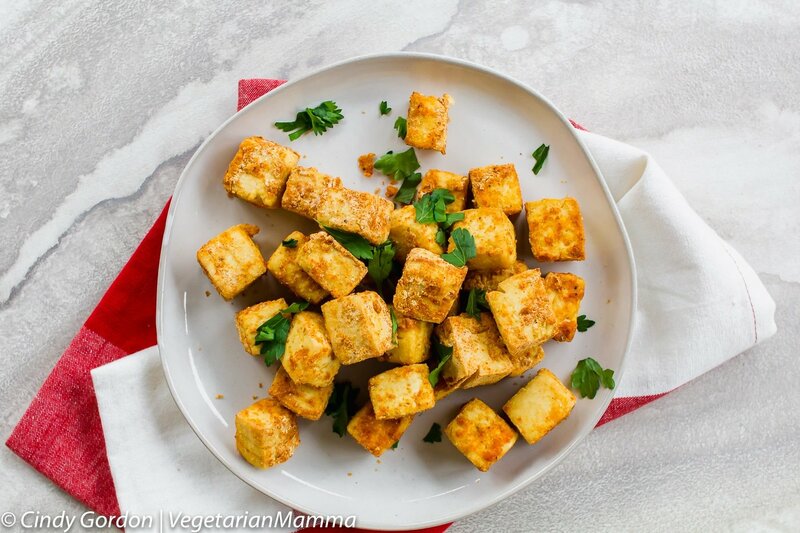 If my family likes tofu, we’re going to keep finding super delicious recipes to make that let tofu be the star of the show! That is pretty much how we developed our airfryer tofu recipe! 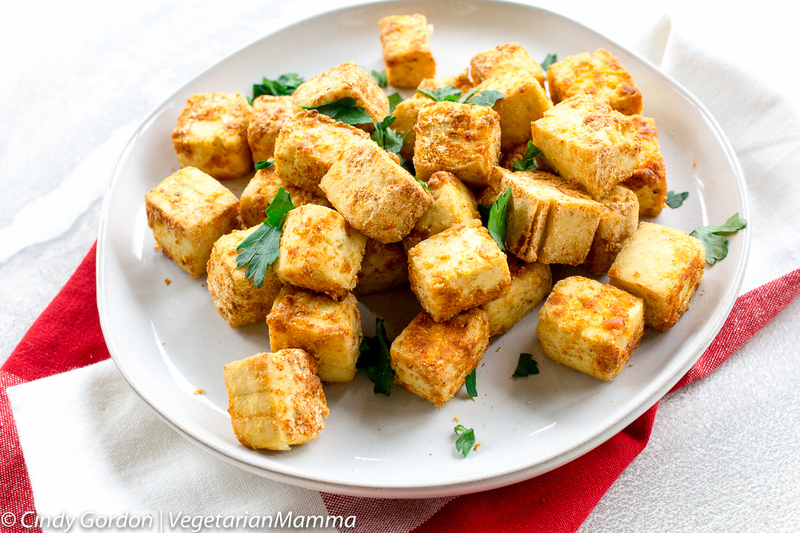 Who would have thought that one of our favorite ways to cook tofu, would be to air fry tofu! Not only is this recipe a quick and easy meal that the entire family loves, it truly is a great source of much-needed protein as well. Finding a food that even the kids love can be a bit tricky at times, but when it comes to tofu, they love it too! If you are new to the tofu world, then take some time to do a bit of research and get educated. You can check out our article on Understanding Tofu – A Beginners Guide or our Benefits of Tofu article. Truth be told, I’ve been playing with the Air Fryer quite a bit lately. It’s so hard not too! While I was thinking of new things to cook in it, I found that it can cook up tofu in a SNAP! Like, super duper easy. No issues at all. Don’t forget to Press that Tofu! 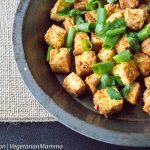 One little tip that I want to share with you is that before I do anything with this tofu recipe, I always press the tofu. I do this with my EZ Tofu Press. If you’re unfamiliar with the pressing of the tofu, it’s basically a way to help remove the water and moisture that can be found in it. It’s nothing new, and a lot of people do this as well. In other recipes pertaining to tofu, I’ve talked about the press many times before also. 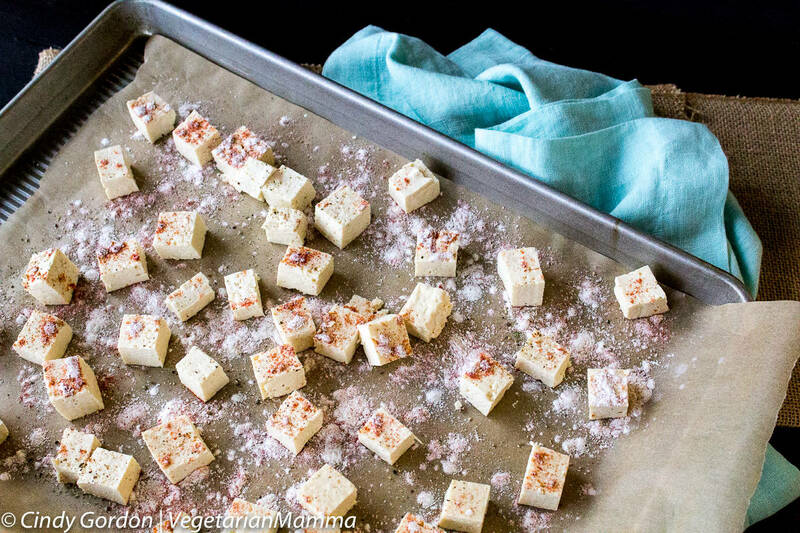 If you find that you like tofu and want to start cooking with it more frequently, pressing is something that you should most definitely educate yourself on! 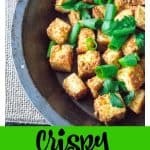 I have played a lot with the cooking options associated with this Air Fryer Tofu recipe and I have found that when I add in a secret ingredient, it makes the tofu even more crispy than I ever thought possible! While many of you may have guessed that it’s gluten-free flour, it’s actually not. The secret ingredient to really give the tofu a crunch is corn starch! Who knew that corn starch was such a lifesaver in the gluten-free world to help in adding that much-needed crunch to certain foods! 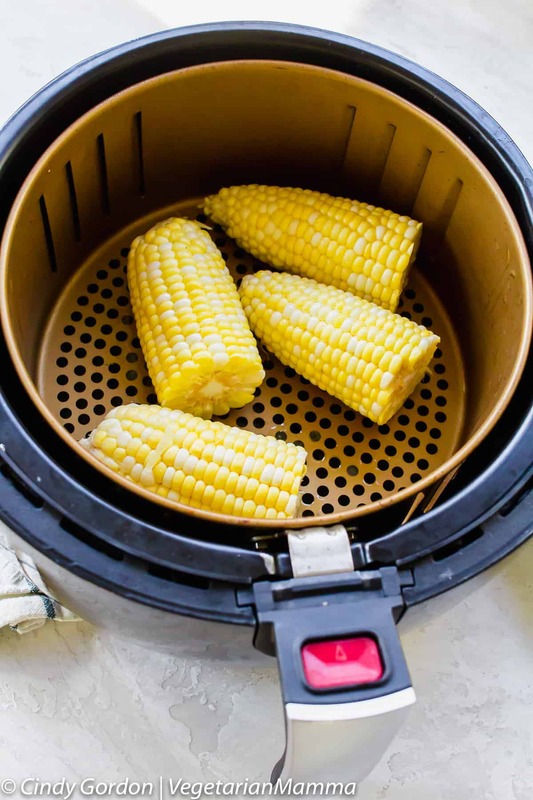 I love to use corn starch with my power air fryer! It truly does make a lot of difference. And that crunch….outta this world! Not only does it taste amazing, but it helps to create a delicious crispy outer coating! And while I love the crunch on its own, for this recipe I mixed some cornstarch and some smoked paprika together for a truly winning combo. After I get the seasonings all mixed together, I add a bit of salt and pepper and gently toss with my hands to coat. Seriously, the prep work is minimal when it comes to this recipe! You know me, right? I love cooking when it’s easy! 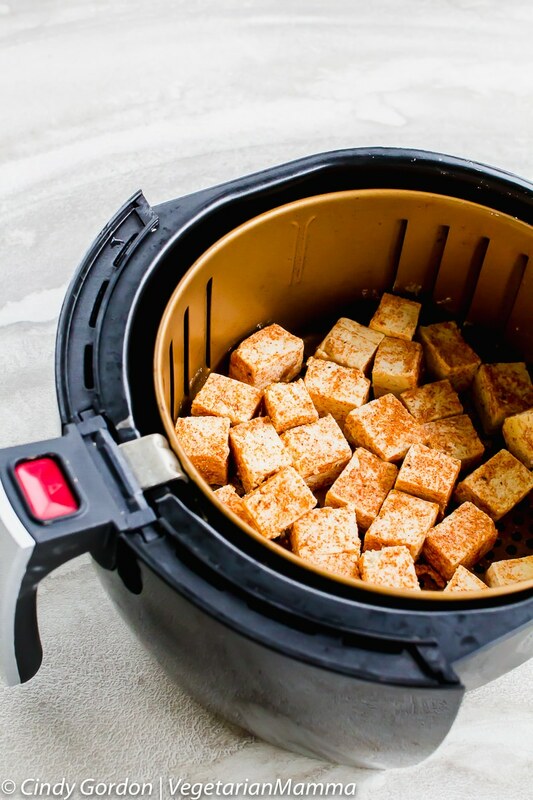 This air fryer tofu is seriously the best. 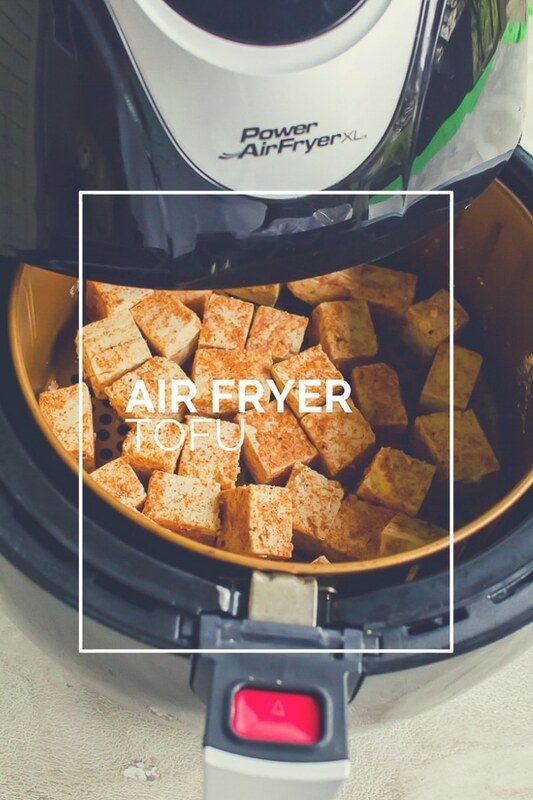 I am not joking when I tell you this airfryer tofu is super easy! 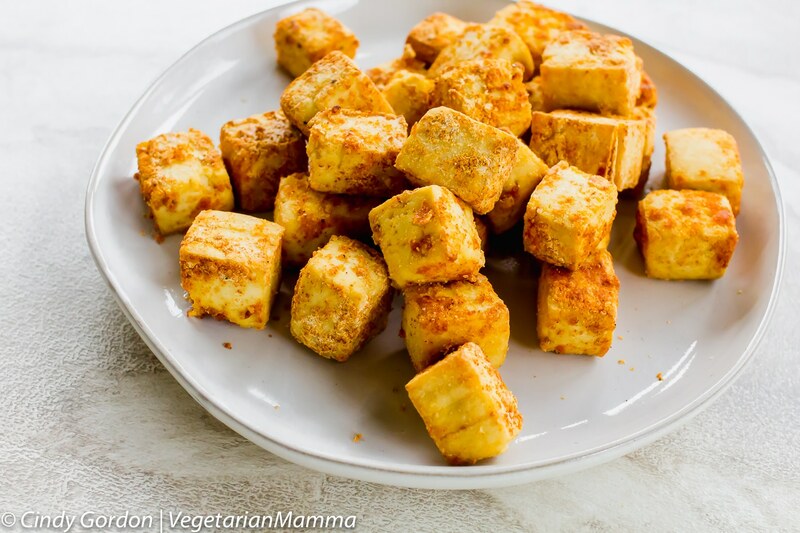 After those few simple steps, all that is left is to toss those tofu chunks into the Air Fryer basket! This is the best part because you know that in just a few moments you are going to have crispy and delicious bites of tofu just waiting for you to eat. Think about the last time that you had a recipe that was truly this simple. If you are looking for a recipe that is so simple, anyone can do then this is the one for you! Please keep in mind that not all air fryers are 100% the same. If you find that during the cooking of this recipe that it isn’t quite as crisp as you would like, then give it a bit more time in the air fryer. The beautiful part about cooking tofu is that you can play around with it a bit to make certain that it’s cooked exactly how you would like! If you want it extra crispy, make it extra crispy! 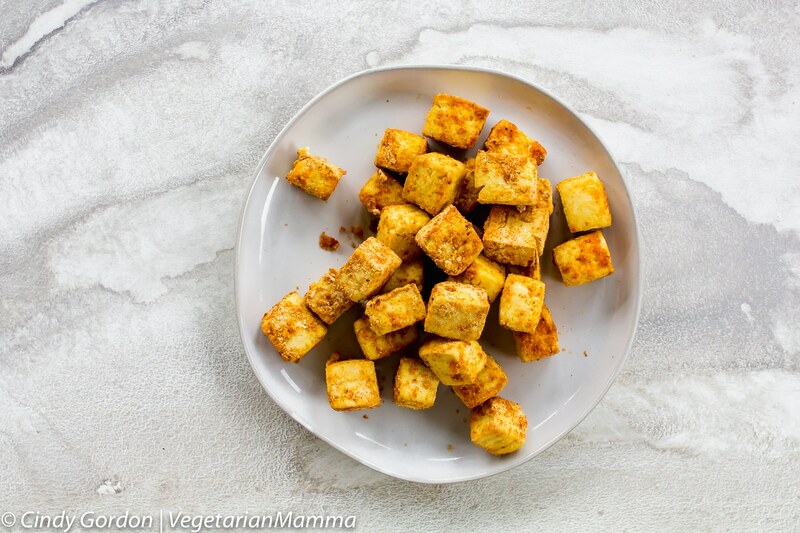 There is no true right or wrong way to make fried tofu and if you love vegan air fryer recipes, this tofu recipe should be right up your alley! 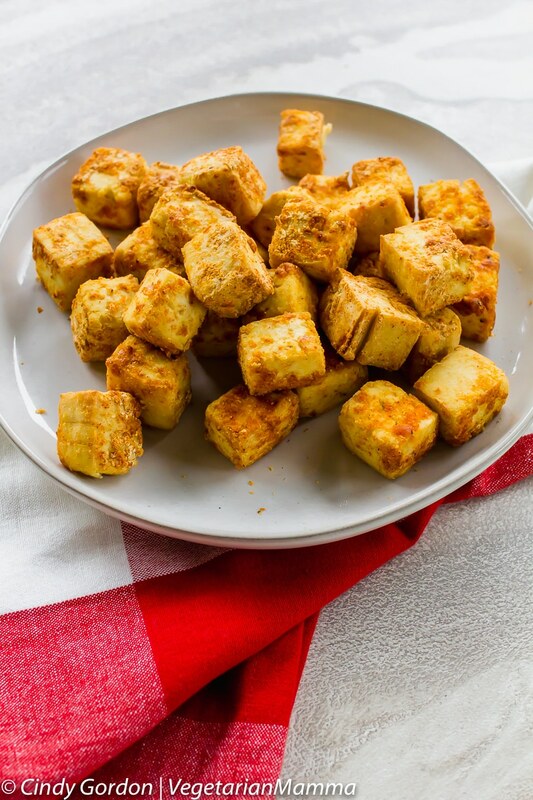 Pro Tip: To help crisp up your tofu and eliminate the powdery coating to your airfried tofu, you can give the tofu bites a quick spritz of oil. This helps the coating to crisp up! Then you will have crispy airfried tofu that will keep you coming back for more! 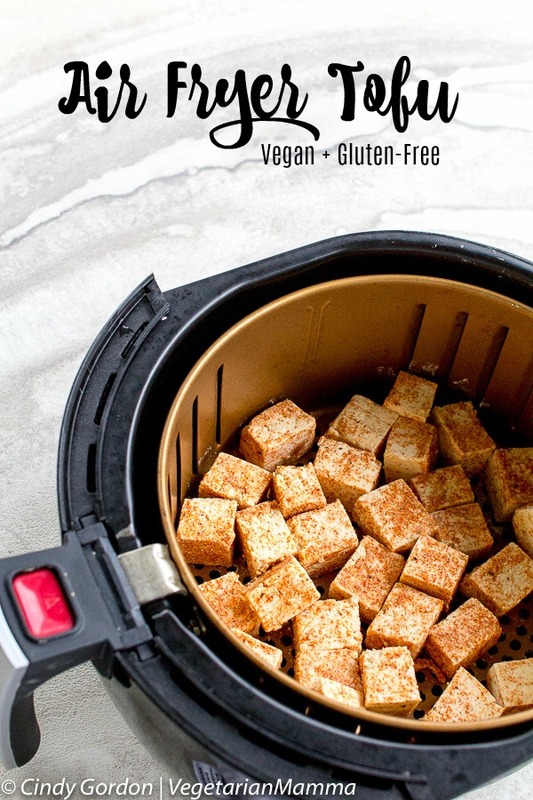 Tofu in the Air Fryer – Spice it up! Also have a bit of fun with the seasonings for your tofu. If you like it spicy, make it spicy. 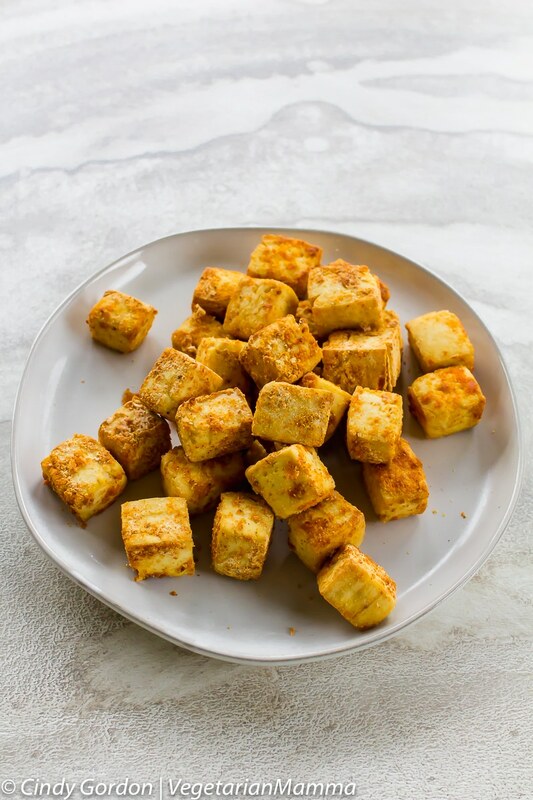 I know that I can appreciate a hint of heat so if I’m making this tofu in the air fryer for myself, I’ll give it quite a kick that I know I’ll enjoy! A little cayenne pepper never hurt anyone, right? But seriously, adding spices to the fried tofu give it such a uqique flavor each and every time. It’s 100% possible that you can make your fried tofu taste different each and every time. Pro Tip: If you feel that your tofu is not crispy enough OR if the cornstarch is powdery you can spray the tofu with a spray oil in the that minute and that will fix the problem! Based upon reader comment it seems that Air Fryers out there are varying widely and that is affecting this recipe. 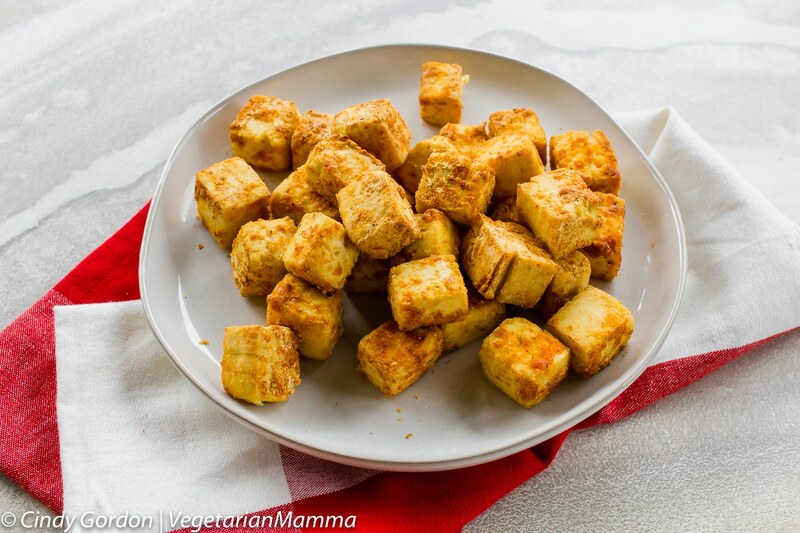 Ready for this easy air fryer tofu recipe? How do you air fry tofu? Tofu can be tricky to cook, but don't let that stop you! 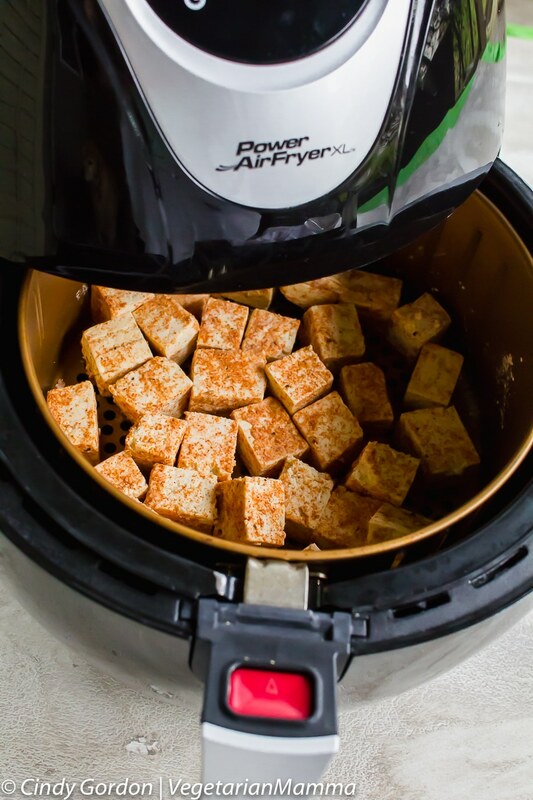 Air Fryer Tofu is a delicious recipe and super simple method for getting a crunchy outside and a soft inside for all your airfryer tofu bites. After pressing the tofu, cut into squares or little bite sized pieces. Mix the cornstarch and smoked paprika together then sprinkle over tofu. Put into Air Fryer basket. Every 4 minutes remove the basket and "shake" to stir up the tofu. Every air fryer is different, be sure to monitor how it is cooking. Hungry for more gluten-free main dish recipes? Be sure to check out our recipe index. You can also visit our Amazon store to see our favorite gluten-free products and kitchen equipment! This post contains an amazon affiliate link. Let’s talk! Leave me a comment telling me if you’ve ever used an Air Fryer. What do you think you’d cook first? We recently updated the photos in this post. The day we originally took these it was quite dark outside (ugh rain clouds!) So we gave them a fresh look! But here is a sneak peak at the old ones! I love tofu and I have this favorite tofu fried rice from an Asian restaurant that tastes heavenly. I would love to try this. Looks so good! Fantastic! That sounds like a plan! I keep reading things about air fryers. I am debating on getting one. These recipes are tempting me. I think you should. Its such a nice addition to any kitchen! My husband and I love tofu! We don’ have air fryer. Sounds like a great cooking tool for healthier cooking. Thanks for the tips on cooking tofu. I have never cooked it, nor have I been brave enough to use the air fryer. No worries at all! Good luck and let me know if you have any questions! You are so welcome. You can spray some oil on the tofu during one of the “shakes” this helps to get rid of that chalkiness! Other seasonings would work great too! Yep, I had the same problem. Way too much corn starch leaving it quite pwdery. I would do no more than 1 tbsp corn starch. I thought it seemed like too much but it was my first time cooking tofu in my air fryer. Hopefully next time will go better! The traditional Japanese dish Agedashi tofu is a fried tofu recipe. The tofu is also pressed but covered in potato starch. The recipe calls for soft tofu so I don’t know if it will work in an air fryer. But fried in oil, the tofu has a light crunch, lighter than tempura. So maybe potato starch might work in place of corn starch. Thank you Christina! I appreciate the information and idea! I love the sound of a light crunch and also the use of potato starch! I am going to research that more! i’m chinese and used to buying softer tofu. does this recipe call for extra firm to start? i don’t have a press. is using paper towels enough? or a towel? does spraying the airfryer grate with oil work to keep the tofu from sticking and breaking apart or should i add more oil in the beginning when coating the tofu. you are very helpful and i like your site! i’ll be coming back again and again to try more airfryer recipes. i’ so crazy about the airfryer i’ve bought them for gifts for friends that are too snobby for them (at the $40 on sale price for small ones). they can get a bigger one once they become hooked too! Thank you for the sweet compliment I appreciate it!! WE are crazy about the air fryers too! WE are hooked! I love that you are buying them for friends too! Cindy!it looks perfect and tasty! Can’t wait to have this anytime of the day, love it! I’m not such a fan of tofu but I have never had them air fried either. The method can make the difference. I think this method will make a difference for you! I have not tried this in my air fryer yet. I think this is a really cool idea and I may have to try it now. When you try, come back and let me know! This tofu looks absolutely amazing! It’s so hard to get tofu looking great and I had no idea that the Air Fryer could make it look like perfection. I’ve been thinking of buying one of these but wasn’t sure whether they would be worth it. Now I am convinced I need one in my life! I do not regret getting one, we love it! I might actually try this out. I’ve had tofu and enjoy it, but I’ve never been the one preparing it. I’m intimidated by it for some reason! That sounds yummy! I need to get an Air Fryer and try this recipe! I have only had tofu once and it was in the form on “scrambled eggs”. I think I would like it this way more! I think you’ll like it this way! Awesome, so glad you tried it and loved it! Thanks for letting me know! You are so welcome, glad you liked it!